Volleyball originated in 1895, around the same time as basketball, and only a few miles away. It was designed to give those with less endurance and mobility a chance to play a competitive game and still get ample exercise. It combines many conventions from both tennis and handball, and it continues to be a dominant sport, with particular emphasis on international play. 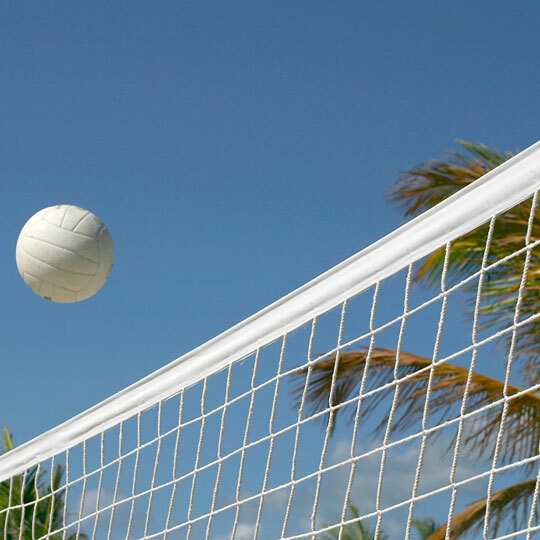 In order to play volleyball, you'll need a net and a volleyball. Many places do offer dedicated courts, which can also be used for badminton. Some beaches, too, have courts already set up. However, buying your own net will allow you to set up nearly anywhere, whether you want to play at the park during a picnic or even on a camping trip. There are several pro-level items that teams and other enthusiasts might consider. A mechanical trainer is great for delivering balls when a team is trying to practice. Mechanical trainers are capable of launching balls from human height, and many also aim downward to simulate digs as well. Schools and facilities will also commonly invest in at least one equipment carrier. They are capable of transporting the net and all hardware, as well as the necessary balls. Volleyball equipment carriers are set on rotating wheels to make maneuvering easy, and cross bars prevent gear from either toppling or spilling out. This volleyball community features volleyball rules and carries a complete line of indoor and outdoor volleyball gear. Shop for a full range of volleyball products by product type or by manufacturer. This sporting goods store chain offers a broad selection of volleyballs, knee pads, nets, and volleyball accessories. Supplier of quality volleyball equipment for high school, college, and professional level players. This manufacturer of sports equipment focuses on making technologically advanced volleyball products for the average player.